Welcome to my blog — a place where I share my inspiration and process for my textile art. Inspired by Georgia O’Keeffe’s close up of flowers I chose an orchid. It has so many lovely curves and movement and looks like a bird when you look at it closely. 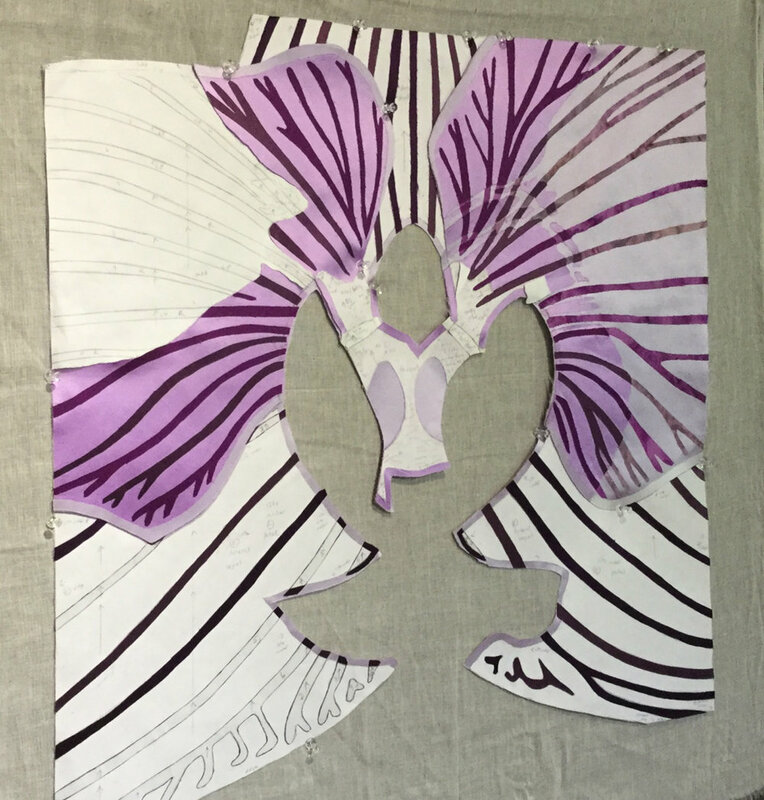 Georgia O’Keeffe stated “Nobody sees a flower—really—it is so small it takes time—we haven’t time—and to see takes time.” So I took the time to look at the orchid closely and create in silk and batik fabrics and stitch what I saw inside an orchid. I took a photograph and then cropped (and rotated) it in a square format until I liked the composition. Purple was my chosen colour for this work as it spoke to me of beauty, richness, mystery, a colour often found in orchids and a colour that O’Keeffe used frequently in her flower paintings. To make the pattern I traced the enlarged image onto white freezer paper using the window as my light source. Freezer paper is great for ironing onto fabric to cut out the templates. It stays in place until you remove it. When all the sections were drawn on the freezer paper I added directional arrows on every piece. This helped me to make sure when cutting out the fabric that the freezer paper template was on the straight of grain of the fabric. Failure to do this can result in the finished assembled work to become distorted with wavy edges. Not good. The fabrics were prepped with white misty fuse to the back, a very light fusible web that doesn’t gum up the needle and maintains the fabric’s textural quality. The silks were fused with sheer cotton interfacing first to maintain their shape, reduce fraying, for ease of handling the fabric and to still keep the same look and feel and drape of silk. In the next image, you can see I have some of the freezer paper still in place. As I make the pattern piece, I remove the freezer paper template to reveal the fabric underneath. This is fun, like unwrapping a present to see what is inside. This is also where you can see if it’s not quite right – that is, the choice of fabric or the design itself. I didn’t like the broken section on the upper right petal so I redrafted the pattern to make it one section. The right bottom part of the petal looked liked it was missing some darker areas and looked unbalanced so decided to add more parts to the pattern this time. When all the pieces were placed and I felt happy with the arrangement I ironed the whole thing onto light muslin. The misty fuse holds the pieces in place. A 2” fabric border was added to the pattern. This allows for extra fabric to put over the foam core later when mounting the work. I then machine appliqued with 100wt silk thread the outside edges of all pieces to the cotton muslin. Next I layered with 100% wool batting and silk organza on the back so now have 3 layers (4 if you count the muslin). Outlining the main sections helps to stabilize the whole work and then it was easier to work within these sections for more detailed stitching. Most of the thread used was 100wt silk and variegated and non-variegated rayon thread. More stitching in the smaller sections. Started on shading. Stitching added depth and textural dimension. I put tack pins on edges of the work in progress to check for distortion. OK so far! Mounted on 3/16” acid-free black foam core after stitching completed. Now off to the framers. See Current Works for professional photo of finished piece.